U.S. 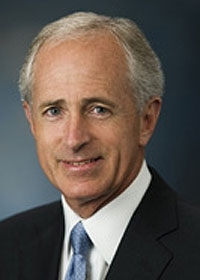 Senator Bob Corker, R-Tenn.
Sen. Bob Corker of Tennessee is not yet convinced that the UAW has given up enough to support the federal loans offered to General Motors and Chrysler LLC. In a statement to Automotive News today, Corker said it was old news that the UAW had agreed in recent days to eliminate the Jobs Bank at GM, Chrysler LLC and Ford Motor Co. The Jobs Bank pays idled UAW workers nearly full wages and benefits for not working. In December, the UAW suspended the Jobs Bank at each of the Detroit 3. The $17.4 billion federal bailout package for GM and Chrysler requires the carmakers to show by Feb. 17 how they intend to bring labor costs in line with those at the Japanese transplants. During Congressional hearings late last year, Corker was among the most outspoken Republican critics of UAW benefits that allow idled workers to collect more than traditional state unemployment benefits. He also targeted supplemental pay, which is paid on top of unemployment benefits, bringing pay for laid-off workers to about 72 percent of working wages. Corker hasnt softened his position since those hearings.